The simple explanation for moss growth in your lawn is – it’s the Pacific Northwest! Moss is as prevalent on the ground as clouds are in the sky. But, looking deeper we know that moss requires more than just persistently rainy conditions to establish itself. Moss that grows in grassy areas is actually a symptom of other underlying problems. As a rule of thumb in this region, if conditions are unhealthy for grass, they are likely to be beneficial for moss growth. Moss can be found virtually anywhere, even in full sun if enough moisture is present. 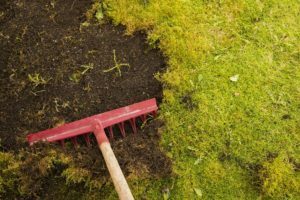 One of the main reasons moss finds a comfortable home in your yard is that the soil PH level is below 6.0. Low PH levels in the soil make it difficult for grass to thrive because nutrients are not available for the plant to take in. Even if your lawn isn’t shaded by a canopy of trees, clouds filter the sunlight and make it that much easier for moss to grow. 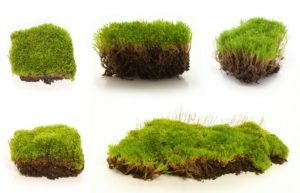 And unless your turf is getting several hours of direct or substantial filtered light, it can have trouble competing against shade-loving moss. It seems strange that drought would contribute to moss growth, but lawns that have been thinned and dried out by the summer months rarely recover fast enough to compete with moss growth in the fall. Similarly, lack of nutrients and poor drainage caused by soil compaction inhibit your turf’s root growth. Anything that hurts grass growth gives moss an advantage. So, in general, working to strengthen your lawn will consequently diminish the chances that moss will take over. We recommend testing and improving the nutrient levels in your soil with lime applications, irrigation, aerating, watering, fertilizing, and mowing. Doing these things at the right time for the right type of turf can be tricky, so make sure you know what type of grass you have and what type of care it needs at different times of the year. Though it’s necessary to use iron-containing moss control chemicals to get rid of moss, it’s not a long-term solution on its own. The element that kills moss is iron, but since it causes rut stains on concrete or anything else it sits on and oxidizes, try to spread it carefully. Evaluate the problem areas of your lawn by looking at shade, nutrient, and compaction levels and watch for improvements. Moss should be killed before thatching or it will spread. Read more about moss in the lawn on our moss resource page.